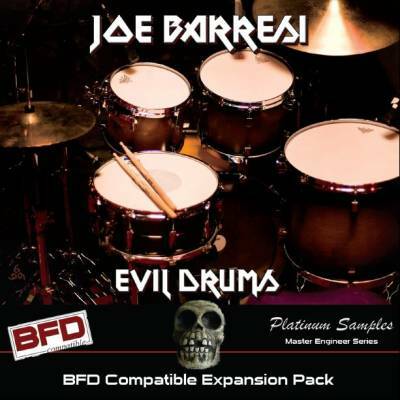 Platinum Samples is proud to announce the release of Joe Barresi's Evil Drums, the second BFD Expansion Pack in their Master Engineer series of drum samples featuring multi-platinum award producing recording engineers. Featuring an ominous 6 full drum kits, 6 kick drums and 6 snares recorded to analog tape at two legendary rock studios using compression and EQ, Joe Barresi (Tool, Queens Of The Stone Age, Bad Religion , The Melvins, Weezer, etc...) has captured a diverse ensemble of drum sounds with as many as 250 velocity levels to create a unique and exquisitely evil expansion pack. Evil Drums also includes MIDI grooves performed by Pat Wilson (Weezer, The Special Goodness). Delivered on 6 DVD's, the Evil Drums expansion pack has 4 installation options to best suit your needs, with the 74 GB SuperSize installation having as many 250 velocity levels for ultimate realism.